The Brass Group and choirs contributed to this fabulous evening in the usual way, with the brass group accompanying all the carols. A wide variety of singing contributed greatly to creating the festive atmosphere. 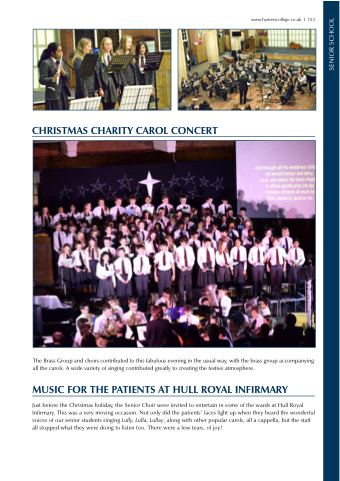 Just before the Christmas holiday, the Senior Choir were invited to entertain in some of the wards at Hull Royal Infirmary. This was a very moving occasion. Not only did the patients’ faces light up when they heard the wonderful voices of our senior students singing Lully, Lulla, Lullay, along with other popular carols, all a cappella, but the staff all stopped what they were doing to listen too. There were a few tears, of joy!